In Fall/Winter 2015, the Ozaukee County Energy Action Team completed the Ozaukee County Energy and Sustainability Plan, which outlines a collection of strategies for county government operations and facilities in an effort to promote economic and environmental stewardship and to improve the quality of life for Ozaukee County’s current and future residents. For more information, including former Community Development Educator Kate Pawasarat’s involvement in the project, visit the Energy Action Team page. 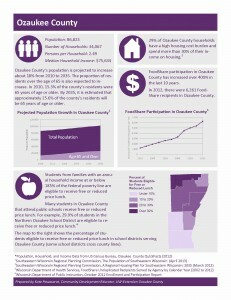 Ozaukee County Factsheet – This one-page factsheet provides information on projected population growth estimates for the county, the percentage of households with a high housing cost burden, and statistics on FoodShare and free and reduced price lunch eligibility rates in Ozaukee County.